Grout and mortar are the two popular cement-based products in addition to the concrete that are used in the construction and home-improvement projects. While they are both cement-based products, their properties and uses differ per project. That said, the use of the other in a place of the other may lead to damages or improper quality of the structures. This article unfolds the main differences between these two products. In a nutshell, mortar comprises of cement, sand and water. Lime is also added to increase the durability of the product. Mortar is predominantly used in the construction industry or home-improvement projects to act as a binding agent between bricks, stones or concretes. It binds well on the trowel and then applied between bricks to hold them together for a long time. When it hardens, it will be extremely difficult to destroy it until such time that it wears out. Mortar relatively contains a low water to cement ratio. This makes it stiff when applied in structures. When installing floor tiles, mortar is also used as a bed upon which the tiles sit. This ensures that the tiles get bound to the ground for a long time. If large amounts of water are added, they could compromise the adhesiveness of mortar. 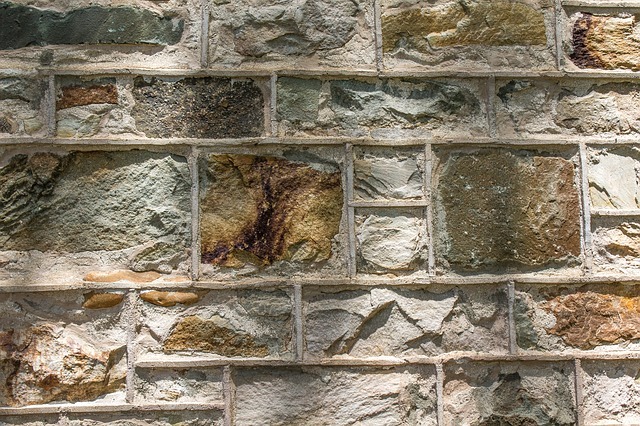 The addition of lime to mortar is also one of the distinguishing factors that set it apart from grout. It has immense benefits. Lime has been used in the construction industry for many years, predominantly in plastic and mortar to enhance their durability. Grout is a highly viscous material that can flow with ease into the crevices of walls or in-between the ceramic and stone tiles. It is also a cement-based product merely made of cement, water and sand. There are varieties of grout such as resin and epoxy. However, the residential applications make use of the sanded and unsanded grout. An unsanded grout, as the name reflects, contains no silica sand in it. It is smooth and often used in filling the narrow cracks less than 1/8 inches. The sanded grout contains fine silica sand which improves the stability of the product. It is therefore suitable for larger crevices between rocks and tiles. However, grout is generally not used as an adhesive material that can bind two structures together. Instead,, it serves as the filler to fill gaps and holes. In contrast, grout contains large amounts of water. But this amount is sufficient not to compromise the quality. Because of this large amount of water, grout will not stick well on the trowel. The builder can pour it directly to the material and it will flow into the gaps. 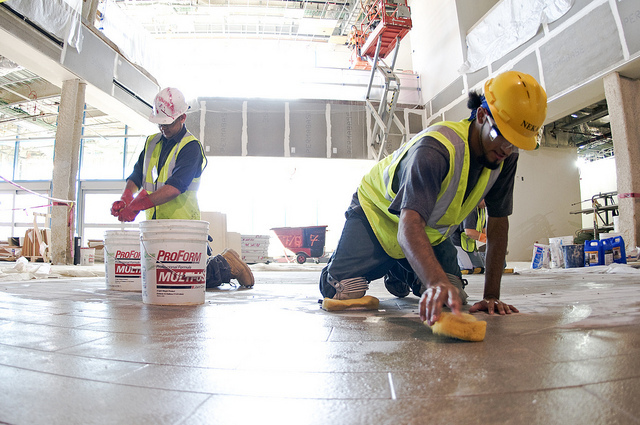 There is no pressure needed to apply grout because of its high viscosity. When applied between tiles, it deters the penetration of water in the tiles by absorbing water. It is a porous material, so it can absorb water and get dirty as times goes on. Grout is available in many colors that can match the design of any tiles or kitchen decors. As water spills on the tiles, it can get dirty and affect the original color. Because of its large amounts of water, grout cannot be used in binding the bricks or stones. Such attempt will pose danger to the dwellers in the structures. Likewise, mortar cannot be used in filling gaps that grout is suited to fill. It’s a low viscous material and such attempt will not be successful, especially on narrow crevices. The instances where grout and mortar are applied together are when the tiles are installed. The mortar works as the tile bed while the grout is used to fill the gaps in between the tiles. Here are the key differences between these two cement-based materials. Grout needs large amounts of water in its making. It is mainly made of the cement, sand and water. Depending on the type, others types of grout can include the finer silica sand to reinforce its strength when applied on wide crevices and gaps. The unsanded grout is applicable in narrow cracks and gaps. It can be poured from one gap to the other without the need of a trowel. On the other hand, mortar requires only small amount of water in its mixture. It is this low water to cement ratio that reinforces the paste qualities of mortar. It sticks well on a trowel to be applied on specific materials to bind them together. Too much water can compromise its paste properties and it may drip on a trowel. Both materials are applied in home-improvement and construction industry. Mortar is applied to stick two structures together. In brick-laying, it binds the bricks or stones together. After some time, it gets dry and hardens. It will then take many years (typically over 25 years) before you can replace it. Mortar is also applied as the tile bed when installing tiles. It helps them to stick on the ground for a long time. On the other hand, grout is applied between ceramic or stone tiles to keep them together and prevent the penetration of water. Grout also dries and hardens but not as stiff as mortar. Grout can also be applied on steel materials to fill in the crevices or gaps. Grout is less stiff than grout. It basically contains sand, cement and large amounts of water. This explains why it is applied with ease without needing a trowel. It flows readily into the gaps. Comparing sanded and unsanded grout, the sanded grout is stiffer. Mortar, on the other hand, is made of lime, cement, sand and less water. It is stiffer. This explains why it is used in binding bricks in the tallest buildings. Because of its low viscosity, mortar does not flow readily into gaps. Grout is made of cement, sand and water. It is further available as sanded and unsanded grout. The sanded contains fine silica sand particles to make it more stable. Lusi Madisha. 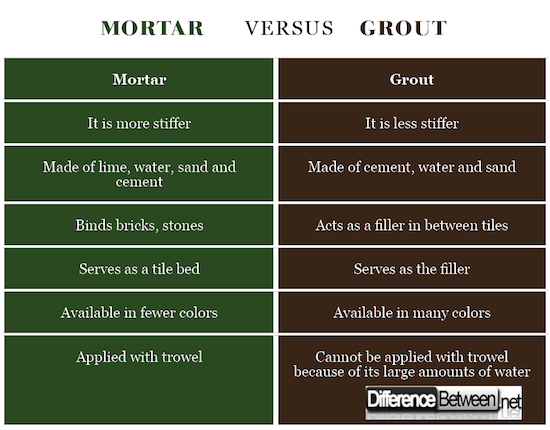 "Difference Between Grout and Mortar." DifferenceBetween.net. November 6, 2018 < http://www.differencebetween.net/object/difference-between-grout-and-mortar/ >. Amrhein S.E, James E. (1980). GROUT THE THIRD INGREDIENT. Accessed at: https://www.masonryinstitute.org/pdf/307.pdf. Masonry Institute of America. Narendra Taly, Ph.D., P.E., F.ASCE (2010). Design of Reinforced Masonry Structures. McGraw-Hill Professional, 2010.